Me Time – those few brief moments you take in the day just for yourself. A short pause in a busy schedule to focus on your well-being and take care of your needs. Glysomed nurtures your skin by providing moisture and protection everywhere your body needs it. From the tips of your fingers, to the soles of your feet, your skin will thank you for taking the time to let this rich, soothing cream soak in. Glysomed Body Lotion gives your skin the love it deserves with a fast-absorbing formula designed to hydrate, protect and revitalize skin. Carefully selected ingredients provide your skin with deep hydration and moisturization. aqua (water/eau), decyl oleate, cetearyl alcohol, propylene glycol, butyrospermum parkii (shea) butter, glycerin, mangifera indica (mango) seed butter, PEG-40 castor oil, phenoxyethanol, alcohol, allantoin, aloe barbadensis leaf juice (decolorized), bisabolol, butylene glycol, chamomilla recutita (matricaria) flower extract, dimethicone, ethoxydiglycol, glucose, hamamelis virginiana (witch hazel) water, lactic acid, panthenol, parfum (fragrance), sodium carbomer, sodium cetearyl sulfate, tocopheryl acetate. New Eczema Control is enriched with the Glysomed glycerine-chamomile blend plus 2% active colloidal oatmeal. Oats are nature’s itch fighter, known to soothe irritated skin. 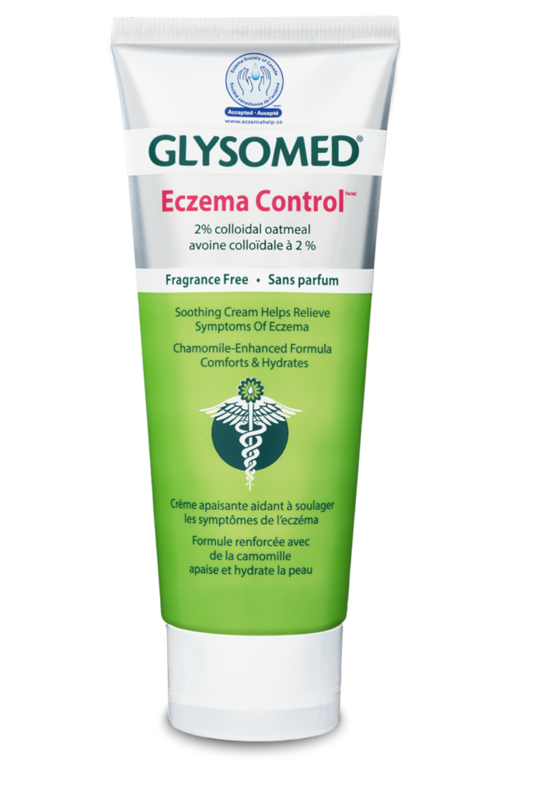 Proudly earning the Seal of Acceptance from the Eczema Society of Canada, Glysomed Eczema Control is a gentle, deeply hydrating and long-lasting non-steroidal eczema itch reliever. Medicinal Ingredients: Colloidal Oatmeal (Oat kernel) 2% (w/w, p/p)Non-Medicinal Ingredients: allantoin, ascorbyl palmitate, avena sativa (oat) kernel extract, avena sativa (oat) kernel oil, BHT, caprylic/capric triglyceride, cetearyl alcohol, chamomilla recutita (matricaria) flower extract, citric acid, dehydroacetic acid, dimethicone, disodium EDTA, ethylhexylglycerin, glycerin, glyceryl stearate, helianthus annuus (sunflower) seed oil, octyldodecanol, PEG-40 castor oil, petrolatum, phenoxyethanol, propylene glycol, purified water, sodium cetearyl sulfate, sorbitol. 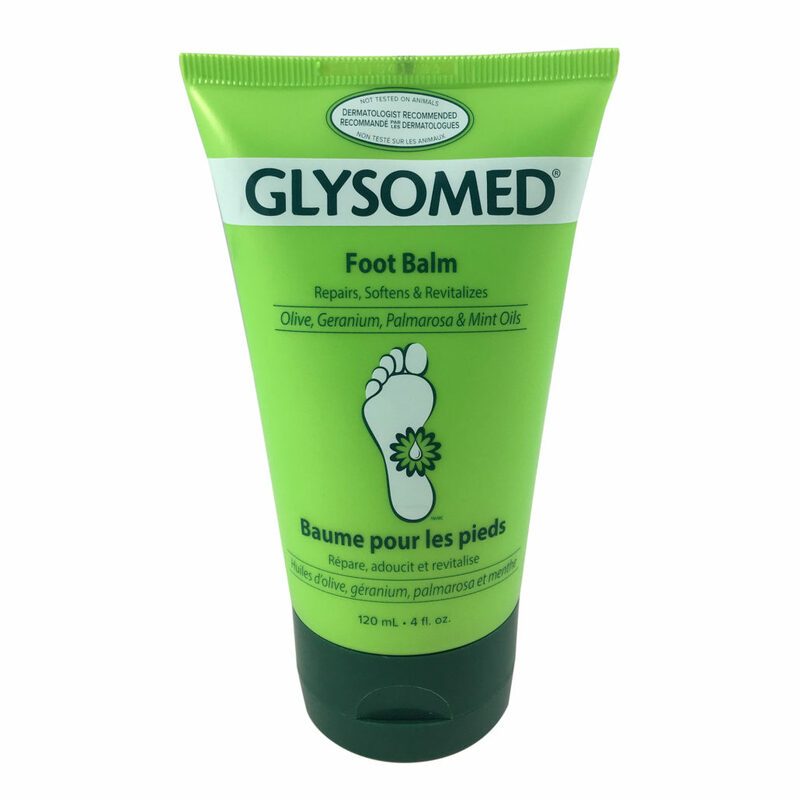 Glysomed Foot Balm provides intense moisturization and is specially formulated to soften, soothe and relieve severely dry, cracked feet and heels. 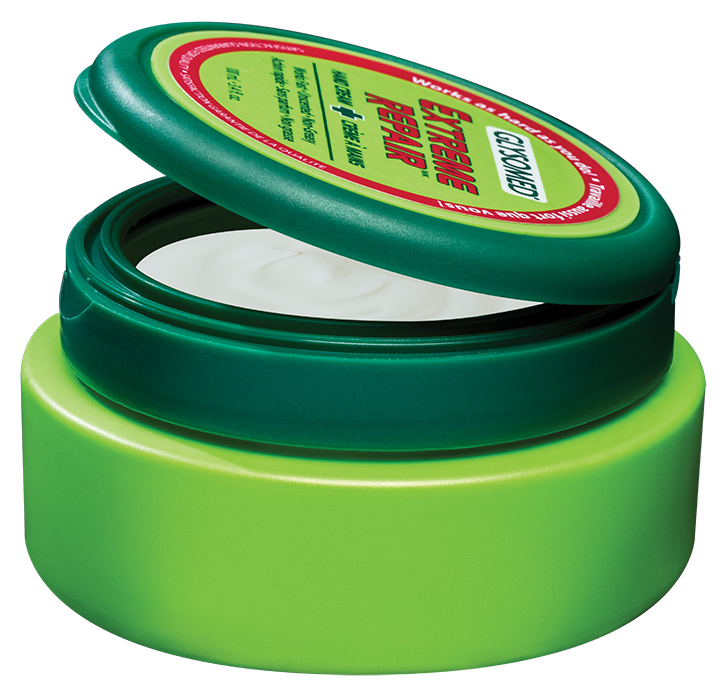 Enriched with shea butter, nourishing olive oil and the invigorating benefits of peppermint oil, this revitalizing balm softens even the roughest feet. Glysomed Hand Cream contains a uniquely effective blend of glycerine, chamomile and silicone to deliver indispensable care to rough, dry hands. 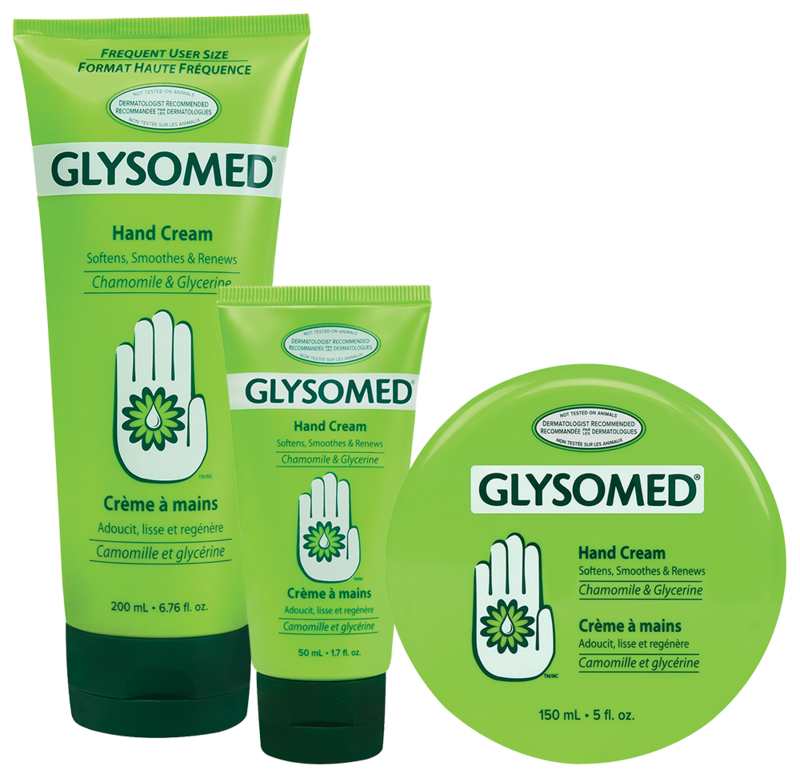 Glysomed Hand Cream locks in moisture to relieve and help prevent dry hands. Aqua (water/eau), glycerin, cetearyl alcohol, caprylic/capric triglyceride, octyldodecanol, sodium cetearyl sulfate, dimethicone, petrolatum, sorbitol, phenoxyethanol, parfum (fragrance), allantoin, methylparaben, propylene glycol, ethoxydiglycol, ethylparaben, propylparaben, butylene glycol, chamomilla recutita (matricaria) flower extract, glucose, lactic acid, hamamelis virginiana (witch hazel) water, alcohol, sodium hydroxide, bisabolol, BHT, ascorbyl palmitate, glyceryl stearate, citric acid. 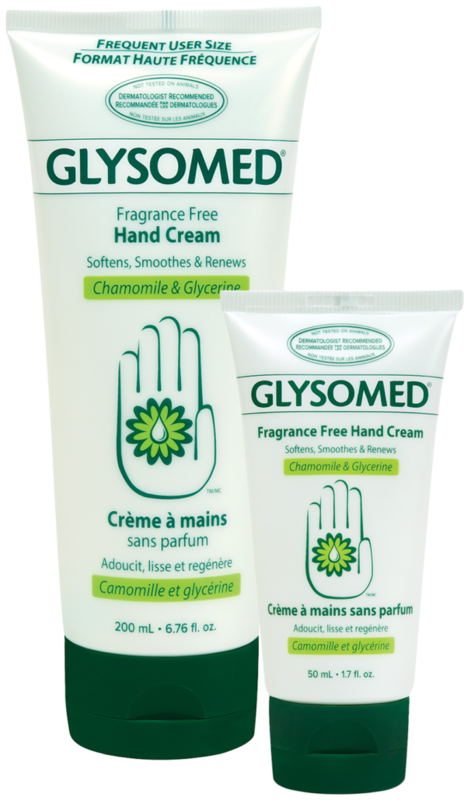 Glysomed Hand Cream contains a uniquely effective blend of glycerine, chamomile and silicone to deliver indispensable care to rough, dry hands. Glysomed Fragrance Free Hand Cream locks in moisture to relieve and help prevent dry hands. aqua (water/eau), glycerin, cetearyl alcohol, caprylic/capric triglyceride, octyldodecanol, sodium cetearyl sulfate, dimethicone, petrolatum, sorbitol, phenoxyethanol, allantoin, methylparaben, propylene glycol, ethoxydiglycol, ethylparaben, propylparaben, butylene glycol, chamomilla recutita (matricaria) flower extract, glucose, lactic acid, bisabolol, sodium hydroxide, BHT, ascorbyl palmitate, glyceryl stearate, citric acid. Extremely dry, cracked hands? NEW Glysomed Extreme Repair works as hard as you do! Concentrated and fast-absorbing, our new hand cream will restore your hands and help defend against recurrent dryness.